I've had Virgin Suicides sitting around in my TBR for over a year. I'm hoping that listing it here will give me an excuse to give it a go. This book was requested yesterday, and I promised I'd send it out today. Just time, I thought, to start it and give up on it....Well, no, that's not how it worked out. I did start it last night and I couldn't go to sleep until I finished it. A dark book, yet with an undertone of lightness. Over the top, almost like a fable, but without the final moralizing. And that is part of what drives the book, the why why why. Would make a good book for discussion, I think. Released on Thursday, May 29, 2003 at U.S. Mail in US Mail, Texas USA. I can't believe I didn't journal this... so sorry debnance! I finished reading this awhile ago and haven't journalled as I'm not really sure what to think of it! I think the absence of a "message" is what is bothering me about it. The story reads well and is engaging, but it's just lacking something. Perhaps I'll rent the movie for some insight. On its way to another BX'er to fulfill a wish. What a wonderful SURPRISE to receive this in the mail today as a RABCK from my good buddy cyberpixie! It is so nice to have others thinking of you. Cyberpixie, thanks for perusing my wish list and fulfilling this wish for me!! I'll journal again once I've read the book. For a first novel this was powerfully provocative and hauntingly surreal. Reading along you feel as though you are a part of the neighbourhood. Watching the Lisbon girls live their lives and then their parting from earth. Excellent novel and I'd like to see the movie for clarification of some points. Thanks cyber-pixie for sending this to me! You're a doll!! Release planned for Saturday, October 25, 2003 at Passed to a fellow Bookcrosser in Toronto, Ontario Canada. Passing this onto my good friend cestmoi when she visits me at my home! Picked up during our mini meetup in the wilds of Omemee today. Thanks Louise! I caught this movie on TV a few nights ago and enjoyed it very much so it prompted me to pull out the novel from somewhere in the middle of Mount TBR...and read it. Well...I have to say this is the first time I have ever seen a movie that is almost EXACTLY like the book!! I was amazed. In some places it was word for word. It was a very sad story, and I would have liked to know more about why the girls were so unhappy and why they felt no one could help them. Many young women go through much worse circumstances and don't resort to suicide...I wonder if they were all mentally ill i.e. depressed/bi polar or something else that drove them to it. Mailed to KarinAlyssa today. Enjoy. I received this nice surprise from Enza. It was on my wishlist and she sent it to me. Thank you so much Enza, I'm putting on top of my TBR. This book is one of my favorite books of all time. I had heard of the story, but reading this novel made it all different and deep. The style was so personal, you could feel being across the Libson's house which was disturbing at some point. Suicide is an option I think no one should choose, but seeing how Mrs Libson acted around the girls and how she was parenting, I can understand the girls' will to escape their home. Run away would have been the right option or explaining to their parents, but something tells me they wouldn't have listenend. However, suicide was desperate, but the only durable choice they had. Thanks to CestMoi for fulfilling my wish and I'm turning this book in a bookray in hope more people will get to read it. I'll be looking for the movie too. It's an official ray and it's American only for the moment and I do include South and Central Americas. If you live in Europe, try Platypussj's ring. It will begin its journey later this week. Try to keep it less than 4 weeks in your home as it's a fairly large ray and the book doesn't take that much time to read. It's off to Wizardsheart in a couple of days. 8. Katilo, Illinois , USA (?? My part of the ray is over and this little book has travelled accross the US and Canada, congrats little book ! This has arrived here safely....am looking forward to reading it! Thank you for sharing debnance! I am sorry to say, that I really didn't enjoy this novel. I only read about the first 50 pages and just couldnt stomach anymore. I think that I would like to rent the movie. The thing that I could not stand was the narrative. The omniscient "we". I just didnt like it. I have read a few books in the past where this narrative was used and hated it. So....I am going to send this book on its way. I am happy that I got the chance to try it...thanks so much for sharing it! this is on its way to Nik-the-Stik today! Great book. Very fast read. I really thought it was a touching story and it kept me enthralled throughout. Thank you for doing this. It will go out to the next person as soon as I get an address. Released on Tuesday, December 07, 2004 at about 9:00:00 AM BX time (GMT-06:00) Central Time (US & Canada) at Bookcrosser in York, Nebraska USA. Received in the mail yesterday. Will read it ASAP. I stayed up late on Christmas Eve finishing this book. It made me want to go back and watch the movie again. I saw it a few years ago but I can't remember the details of it. Anyhow, the book was oddly compelling and detailed, and a quick read to boot. I'll PM the next person on the list for the ray and send the book out ASAP. Thanks for including me. I sent the book to the next person on Monday December 27. Received the book today. I hope to get a good start on it this weekend! Did not like what I could read! I just received The Virgin Suicides today--thank you, mamawolfie, for passing this along to me. Looking forward to it. Thank you, KarinAlyssa, for including me in this bookring:) This novel was certainly engrossing. I saw the movie a long time ago, and agree with beckerbuns that I'd like to see it again, now. Eugenides is a fantastic writer, and this story certainly succeeded in being haunting and surreal. I admired the elm tree metaphor; this sad family was diseased and dying. The way the entire neighborhood quietly knew this, and kept their distance, added to the surreal nature of the plot--surely, in real life, four girls absent from school for such a long period of time (among other things) would result in some sort of intervention. Or, I like to think so...I liked the narration, by a handful of sensitive boys who struggled to understand the unknowable, because it rang true to me--try as they might to scope out what was going on in that house, they never penetrated the nature of the despair and isolation, and they were forever affected by it. Which, I suppose, circles 'round again to the elm tree metaphor. Thanks again:) will send this on soon. I received this in the mail a few months ago...many apologies for the delay! I enjoyed the book as much, if not more, than the movie, and as was mentioned by a few others, now I want to see the movie again. A haunting, moving read. I will PM katilo for a mailing address and try to get this bookray moving again asap! mailed this out to katilo! thanks, debnance for sharing! Got it in the mail yesterday and plan to read it soon. Thanks! This wasn't quite what I expected, having loved Middlesex, I expected to love this as well...but I didn't; in fact, I found it quite boring and many times I put the book down and struggled to continue reading it. It was almost a chore to finish, I skimmed over many parts of it. The beginning and ending were the only interesting parts, the rest just bored me. I couldn't connect with Bookharlot, so I'm shipping this book out to Sherria, the next name on the list. Enjoy! Thanks for sharing! Arrived safe and sound from katilo. I'll start this as soon as I finish my current read and post my thoughts. I read Eugenedies "Middlesex" a year or two ago and absolutely loved it. His writing has obviously matured between this book and Middlesex. That's not to say that I didn't enjoy it, because I did, but I think I expected the brilliance of Middlesex and what I got instead was a good novel. The perspective of this story added an interesting dimension to the tale, thought it frustrated me at times. Watching the girls through the pubescent memories of neighborhood boys obsessed with them left me feeling like there was so much more I *could* have known about the family but wasn't able to. I suppose that was the point though - how things looked from outside and the possible interpretations of their actions without knowing the true motivations. I really would have like to have more of the girls' perspectives though, to really get inside their heads and lives. I haven't seen the movie based on this book, so I didn't have any knowledge of the plot line. It moved well, with some unexpected twists that kept it interesting and kept me turning the pages to find out how things would end. Eugenedies created characters that I really felt sorry for, including the neighborhood boys smitten with the Lisbon girls as well as the Lisbon family. The picture of the family was quite conflicted - happy, smart girls with a very close connection trapped in a situation that became unbearable for them. They became "beautiful victims"...with almost a fairy tale quality to the story (back when fairy tales didn't always have happy endings and were often quite morbid). 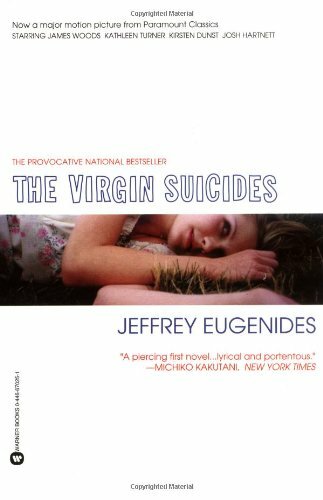 The Virgin Suicides was a good book - not great like Middlesex, but very readable and certainly evidence of Eugenides talents. Thanks for sharing this KarinAlyssa. I'll be passing it on to mysterylady36 this week as Senorag has PM'd disabled and I have been unable to contact her. I thought that this book portrayed very realistically the way various parts of a community acts when someone commits suicide. No one really ever knows for sure why someone does it and if they were close to the person, many times they wonder about it for the rest of their lives much like the narrators of the story did. Also, other people who only know the person in passing may distance themselves from the family because they don't know what to do or say or how to act and eventually just completely cut them out of their lives. Even though the ending of the story wasn't very satisfying, it mimics the feelings a person has when this tragedy strikes. Even if you think you may know why, you still don't understand. Bcosta has asked to be skipped. I will be mailing to Butlin soon. Received today. One book ahead of this one. Although I did enjoy this book, I didn't find it "a tender, wickedly funny tale". I think I'd like to check out the movie and also the other book people mentioned - Middlesex. Off to the next person once I receive address. "Books are the compasses and telescopes and sextants and charts which other men have prepared to help us navigate the dangerous seas of human life."